The word GOALS printed on clothespin clipped cards in front of defocused glowing lights. Do you know where you want to be in the next ten years, or maybe even in just five years? For millions of people, this question will raise more questions, and together with that, a lot of uncertainty. Most people are simply wandering through life with absolutely no goals set into place in order to help guide them toward a more successful future. Without goals, how do you know what you should do next in life, where you are going, or what you are aiming for? It is unfortunate that the majority of people are not striving toward anything in life, “just being”. 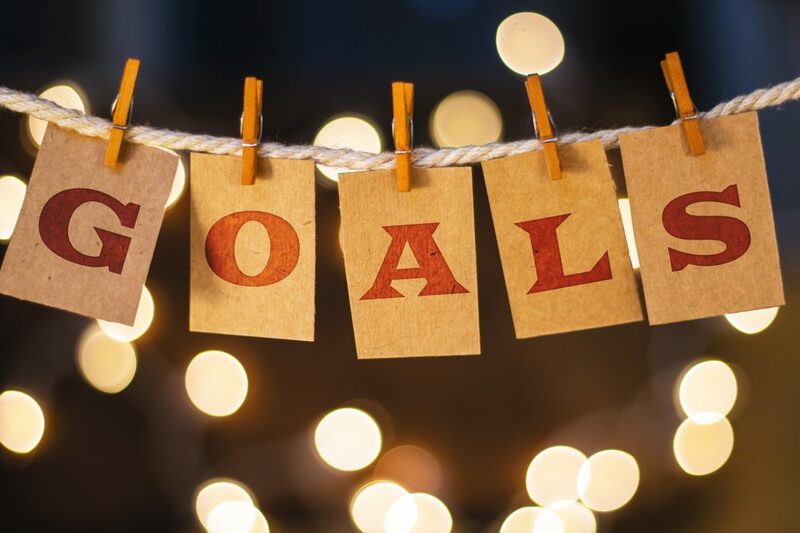 Studies have proven that setting personal goals for your life can help you be more productive and feel more confident in the meaning of your own life. One excellent example of how goals have been proven to provide better motivation to the average person would be a book called the “Toward a Theory of Task Motivation and Incentive.” The book was published in 1968, by author Edwin A. Locke. Today, this theory is commonly called Locke’s Goal Setting Theory and revolves around how setting higher goals in life can help to keep you on track and give you a reason to work harder in order to achieve those goals. How Do You Go About Setting Realistic Life Goals? In this post, we are going to take a look at why it is so essential for you to set goals in your own life. We will also be taking a look at some simple strategies and techniques that can be used to not only set effective goals that will help to keep you on track with your journey, but also how you can make sure that you continue to strive toward that goals, and assure that you do reach them in the end. First, let’s clear this up – life goals are a little different than professional goals. Yes, there are times where a life goal may seem like a professional goal, but in essence, a life goal only revolves around what you do at work and what you wish to achieve in your career. With life goals, you set broader goals about your personal life, and often times these goals will not even fit into a list of professional goals. For example, a life goal could be that you would like to immigrate to another country, say from the United States all the way over to Japan, within the next decade. Now, on the other hand, a professional goal might be to move up from an assistant position toward a managing position within the next five years. When you have goals set in place – both short-term and long-term goals – they will challenge you in order to perform better, get things done faster, and be more thorough in everything that you do, including projects that you take on. If you have goals to strive for, you will be able to understand better which areas of your life need improvement, what factors of yourself you need to work on, and what you need to do in order to accomplish your goals. By breaking down goals, you have a big goal that you are striving toward, as well as smaller goals. This way, that big goal won’t seem as impossible anymore. You’ll be able to see a clear path that those smaller goals form toward the big goal, and things will suddenly start to seem more positive. Instead of thinking that you might one day achieve a specific goal in your life, such as move abroad to a new country, or perhaps have one million dollars in your bank account, when you have goals in place, you know that you can get there with hard work from your side. No more dreaming – as now you are able to realize those dreams and make them a reality. With goals in place, you are also able to reward yourself, which will ultimately help to keep your motivation levels high. If you are not striving toward something specific, how would you ever be able to congratulate yourself, or reward yourself for achieving something that you have been striving for? By setting goals, you can also flip the tables if you are finding yourself trapped in negative thoughts frequently. You are able to feel more successful as you achieve those smaller goals, and life starts to become more positive. People often overcomplicate the process of setting goals. This leads to delaying the process of setting up your goals and ultimately giving up on the process entirely. There really is no need to make things too complicated – setting goals should be a relatively easy task, since you know yourself better than anyone else. A good suggestion would be to set aside a few hours on a Sunday, for example, or any other day that you have some extra time. Get some quiet time for yourself so that you can think clearly – get out a piece of paper and a pen, or if you like to stay up with modern times, get out your smartphone. You really need to think here – think about where you see yourself in the next ten years. It is a much better idea to start with that bigger goal that you wish to achieve over the long-term, and then start to work on the smaller goals that you need to achieve. Do you see yourself in a different country? Owning a house? Riding a new car? Whatever the goals are that you would like to achieve in the next decade, write them down. Consider what success really means to you here. For some people, success is measured by the amount of money available in their bank account. For others, success has a completely different meaning. Think about what the word truly means to you – this is something that you would ideally be striving for. When you have written down your long-term goals, the ones that you wish to achieve in order to feel accomplished and successful, you will see that they seem big. They may even seem almost impossible to achieve. This is why chunking your goals into smaller ones is so important – by breaking them down, you’ll be able to set actionable short-term goals for yourself that are more achievable, and they will ultimately add up to help you achieve that big one that you are now going to be aiming for. Let’s say, for example, that you would like to live in a different country within the next decade. You can’t just pack up and leave right now – there are certain obstacles in your way, most likely. You might not be in the financial position to do so. If you have debt, then you will likely need to pay that off before you make the big move. Perhaps you will also need to gain new skills in order to find a higher paying job in the new country. These are all smaller goals that you might have to achieve in order to get to the big one within the next decade or so. Try to be as specific as possible. If we go back to the Edwin Locke Goal Setting Theory again, we see that he found that setting higher goals and being very specific is what pushes people to achieve their goals. Don’t set a goal like “perform better at work” – sure, if you perform better, you might have a chance to get a raise, giving you some extra money in order to save up. Unfortunately, this goal is not clear. Setting a goal that is clear – let’s say “close five extra deals each day” – will give you a better guideline to follow. When you close five extra deals a day, what is the end game? Perhaps you are getting $250 extra in commission at the end of the month. How much of this should then go into your savings? And how much savings do you need? What will the savings be used for? I know this sounds a little complicated – and I have mentioned that goal setting should not be overcomplicated. But when you sit down and think about your big goal and then start breaking it down, things will not be as complicated as they might seem right now. In addition to setting up short-term goals that are essentially a breakdown of your bigger goals, there is another task that you should consider. And this includes a few short-term goals that might not be specifically part of that longer-term goal, but rather specific challenges that you might want to set for yourself. For many people, even small goals that do not have a real role to play in their longer-term plans for themselves can be helpful to ensure they can stay motivated and continue to strive for the bigger picture that they have visualized. Now, these are only a few examples. The specific short-term goals that you might set for yourself will be different from someone else’s goals. You will need to think about the short-term things that you wish to do. Have you ever wondered how it would be to go hiking? Or maybe you have always wanted to go down to the museum? Set a goal to see a new monument every month for the next year. Or maybe set a goal to go hiking at least once a month. While these small goals do not seem to have any significance in your plan to reach a point where you can move to a completely different country, they can be extremely motivational. Your longer-term goals will take time to achieve – even the broken down goals will take some time. When you set these small goals for yourself, you’ll be able to achieve them in shorter periods of time and show yourself that you can commit to achieving something that you set out to aim for. You’ll also get the satisfaction of ticking off the goal from your list and rewarding yourself for actually doing what you set out to do in order to get to that point. With this in mind, you’ll start to feel more positive about reaching the larger and longer-term goals that you have on that piece of paper or captured on your smartphone. And let’s face it, motivation is by far one of the most important factors that cause people to give up on making their dreams a reality because they feel that they are unable to achieve the goals that they need to reach. Setting life goals can be a tremendously helpful resource in your life, giving you the ability to know and truly understand what you are striving toward, and feel more meaning in every moment. Unfortunately, many people are not setting goals for themselves, and those who have set goals often end up just switching back to a life where they are striving toward nothing at all. Blaming others doesn't just hurt them, it hurts you. Why you should take 100% responsibility and not let yourself off with blaming others. Is Strategy As Simple As Saying ‘No’?